Clear blue skies with a temperature of 77 °F (25 °C); wind out of the north/northeast at 5 mph (8.0 km/h). The 2015 Cheez-It 355 at The Glen was a NASCAR Sprint Cup Series race held on August 9, 2015 at Watkins Glen International in Watkins Glen, New York. Contested over 90 laps on the 2.45 mile (3.94 km) road course, it was the 22nd race of the 2015 NASCAR Sprint Cup Series season. Joey Logano won the race, his second of the season. Kyle Busch finished second. Kevin Harvick finished third. Matt Kenseth and Kurt Busch rounded out the top five. A. J. Allmendinger won the pole for the race and led 21 laps on his way to a 24th-place finish. Kevin Harvick lead a race high of 29 laps on his way to a third-place finish. The race had eight lead changes among eight different drivers, five cautions for 16 laps and one red flag for nine minutes and three seconds. This was the tenth career victory for Joey Logano, second of the season, first at Watkins Glen and first at the track for Team Penske. The win brought Logano to within 42–points of Kevin Harvick in the points standings. Despite being the winning manufacturer, Ford left Watkins Glen trailing Chevrolet by 70–points in the manufacturer standings. The Cheez-It 355 at The Glen was carried by NBC Sports on the cable/satellite NBCSN network for the American television audience. The radio broadcast for the race was carried by the Motor Racing Network and Sirius XM NASCAR Radio. Watkins Glen International, the track where the race was held. Watkins Glen International, nicknamed "The Glen", is an automobile race track located in Watkins Glen, New York, at the southern tip of Seneca Lake. The sports car racing facility is owned by the International Speedway Corporation. It was long known around the world as the home of the United States Grand Prix, which it hosted for 20 consecutive years (1961–1980) but since 1948, it has been home to road racing of nearly every class, such as Formula One, the World Sportscar Championship, Trans-Am, Can-Am, the NASCAR Sprint Cup Series, the International Motor Sports Association and the Verizon IndyCar Series. Initially, public roads in the village were used for the race course. In 1956, a permanent circuit for the race was built. In 1968, the race was extended to six hours, earning the nickname "6 Hours of Watkins Glen". The circuit's current layout has more/less been the same since 1971, although a chicane was installed at the uphill esses in 1975 to slow cars through these corners, where there was a fatality during practice at the 1973 United States Grand Prix. The chicane was removed in 1985, but another chicane called the "Inner Loop" was installed in 1992 after a fatal accident during the previous year's NASCAR Winston Cup event. The circuit is known as the Mecca of North American road racing and is a very popular venue among fans and drivers. Kevin Harvick entered Watkins Glen with a 46–point lead over Joey Logano. Dale Earnhardt, Jr. entered 63 back. Jimmie Johnson entered 67 back. Martin Truex, Jr. entered 86 back. The entry list for the Cheez-It 355 at The Glen was released on Monday, August 3 at 9:00 a.m. Eastern time. Forty-four cars were entered for the race. All but the No. 95 Leavine Family Racing Ford, driven by Michael McDowell, were entered the previous week's race at Pocono. The three driver changes for this race were Chris Buescher, making his sixth Sprint Cup Series start and first since Talladega in May, Boris Said – attempting to start the race in the No. 32 Go FAS Racing Ford – and T. J. Bell – making his first Cup Series start since the 2012 season – driving the No. 62 Premium Motorsports Chevrolet. Clint Bowyer was the fastest in the first practice session with a time of 1:09.412 and a speed of 127.067 mph (204.495 km/h). Jeff Gordon was the fastest in the final practice session with a time of 1:09.267 and a speed of 127.333 mph (204.923 km/h). A. J. Allmendinger, seen here at Sonoma Raceway, scored the pole for the race. 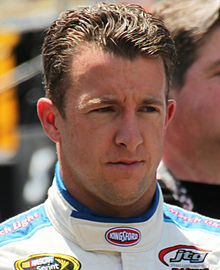 A. J. Allmendinger won the pole with a time of 1:08.993 and a speed of 127.839 mph (205.737 km/h). "Track position is critical around here," Allmendinger said. "Everybody is so close, it's tough to pass, you start beating and banging on each other, and your fenders get torn up. So this is a good start, and strategy plays a lot in this race - fuel mileage and everything. I don’t know if I’ll sleep any better tonight, but I’ll be ready for Sunday." "That was all I had and I’m content with it," said Tony Stewart after qualifying third for his first race at Watkins Glen since 2012. "Three good weeks of qualifying make me happy, at three different tracks with three different packages. That's an awesome way to start the weekend." "Our laps weren’t great, we were just OK," said Kyle Busch after qualifying eighth. "We were way too loose and didn’t have the balance we needed to get the speed out of it for some of the corners." The race was scheduled to start at 2:18 p.m., but started at 2:23 p.m. when A. J. Allmendinger led the field to the green flag. On lap 3, Jimmie Johnson overshot the entrance to the inner loop and was forced to come to a complete stop before continuing. As a result, he fell from ninth to 22nd. On lap 10, Aric Almirola got loose and spun out in turn 1. Paul Menard, who took the outside line, made minor contact with him. Both drivers continued on and the race remained green. Outside polesitter Martin Truex, Jr. passed Allmendinger in turn 11 to take the lead on lap 22. That same lap, Kevin Harvick climbed his way to second, putting Allmendinger in third-place. Jeff Gordon pitted from eighth on lap 24. Debris on the backstretch brought out the first caution of the race on lap 26. The debris came from Greg Biffle's car. Cole Whitt opted not to pit and assumed the lead Denny Hamlin and Jimmie Johnson were tagged for speeding on pit road and restarted the race from the tail-end of the field. The race restarted on lap 29. Brad Keselowski passed Whitt in turn 1 to take the lead. On the same lap, the hood of Denny Hamlin's car flew up. He didn't pit that lap and was black flagged for not pitting to put the hood down. As he pulled off pit road, another piece of debris flew off his car and landed in the esses. This brought out the second caution of the race on lap 32. The race restarted on lap 36. Justin Allgaier got loose and spun out exiting turn 1, but the race remained green. Kyle Larson got loose and made contact with Austin Dillon on lap 42. Both went spinning in turn, but the race remained green. Debris on the backstretch brought out the third caution of the race on lap 46. The race restarted on lap 50. An accordion wreck on the front stretch brought out the fourth caution of the race. The amount of fluid on the front stretch brought out the red flag. Allmendinger's car lost power and came to a stop past turn 10. After nine minutes and three seconds, the red flag was withdrawn and the race continued under caution. The race restarted on lap 55. Kyle Busch tapped Keselowski going into turn 10 and took the lead on lap 57. The fifth caution of the race flew on lap 57 when Tony Stewart came to a stop just before reaching the inner loop. He jumped onto the radio and said that something broke in the drive-train. In an unrelated incident, Johnson spun out in turn 5. Matt Kenseth opted not to pit and assumed the lead, dropping Busch back to 21st. The race restarted on lap 61. Harvick passed Kenseth going up turn 2 to take the lead. Martin Truex, Jr. got out of the groove in turn 11 and made an unscheduled stop with 22 laps to go. The culprit was a flat left-front tire. Joey Logano, seen here at the 2015 Daytona 500, scored his tenth career victory at Watkins Glen International. Harvick was still leading with ten laps to go with no guarantee of making the finish on his fuel load. Allmendinger was the first to run out as he pitted from the top ten with seven laps to go. Harvick ran out of fuel on the final lap and was passed by Logano going into turn 11 who took the checkered flag. “I was running down Harvick there for a little bit and once I got close to him he started to pick up his pace a little bit, which was good because I needed him to run out of gas,” Logano said. “I started to catch him a little bit and I drove into one too hard and started to wheel hop. I just about lost it and at that point you just hope he runs out of gas, which he did in the last corner. It makes up for last week. We lost the race last week the same way, so it makes up for it to get it this week.” “I had a chance,” Kyle Busch said after finishing second. “I could’ve went up there, I could’ve raced the 22, I could’ve passed him. I felt like I was better than he was, but my crew chief called in scared on the fuel situation from last week and I don’t blame him. We definitely didn’t want to run out again. We wanted to make sure we could be there at the end.” “We ran pretty good with just the way the fuel strategy worked out, we had to save a lot battling with Kevin (Harvick)," Kenseth said. "I thought (Joey Logano) and (Kyle Busch) were going to go right by me and we actually had a lot of car left." MRN had the radio call for the race, which was simulcast on Sirius XM NASCAR Radio. Joe Moore, Jeff Striegle and two–time Watkins Glen winner Rusty Wallace called the race from the booth when the field was racing down the front stretch. Dave Moody called the race from a scaffold outside of the esses when the field was racing through turn 1 and up the esses of turns 2, 3 and 4. Mike Bagley called the race from a scaffold outside of the outer loop when the field was racing up the back straight, through the inner loop and down turn 5. Kurt Becker called the race from a spotter stand outside of the short chute when the field was racing down the short chute and rounding turns 10 and 11. Winston Kelley, Alex Hayden and Steve Post worked pit road for MRN. Kevin Harvick left Watkins Glen with a 42–point lead over Joey Logano. ^ "2015 NASCAR Schedule" (PDF). NASCAR.com. NASCAR Media Group, LLC. August 26, 2014. Retrieved August 3, 2015. ^ "Watkins Glen International". NASCAR.com. NASCAR Media Group, LLC. January 3, 2013. Retrieved August 3, 2015. ^ "Entry List". MRN.com. Motor Racing Network. August 3, 2015. Retrieved August 3, 2015. ^ "First Practice Results". MRN.com. Motor Racing Network. August 7, 2015. Retrieved August 7, 2015. ^ "Final Practice Results". MRN.com. Motor Racing Network. August 7, 2015. Retrieved August 7, 2015. ^ "Qualifying Results". MRN.com. Motor Racing Network. August 8, 2015. Retrieved August 8, 2015. ^ "Cheez-It 355 at The Glen Results". MRN.com. Motor Racing Network. August 9, 2015. Retrieved August 9, 2015. ^ "Points standings" (PDF). Jayski.com. NASCAR Statistics. August 9, 2015. Retrieved August 9, 2015. ^ "Manufacturer standings" (PDF). Jayski.com. NASCAR Integrated Marketing Communications. August 10, 2015. Retrieved August 10, 2015. ^ Paulsen (August 10, 2015). "NASCAR Overnights Drop at The Glen". SportsMediaWatch.com. Sports Media Watch. Retrieved August 11, 2015. ^ a b Paulsen (August 10, 2015). "More Multi-Year Lows For NASCAR on Cable". SportsMediaWatch.com. Sports Media Watch. Retrieved August 11, 2015. ^ McFadin, Daniel (August 7, 2015). "Clint Bowyer fastest in first Sprint Cup practice at Watkins Glen". nascartalk.nbcsports.com. NBC Sports. Retrieved August 7, 2015. ^ McFadin, Daniel (August 7, 2015). "Jeff Gordon fastest in final Sprint Cup practice session at WGI". nascartalk.nbcsports.com. NBC Sports. Retrieved August 7, 2015. ^ a b c d Pistone, Pete (August 8, 2015). "Allmendinger On Pole at The Glen". MRN.com. Motor Racing Network. Retrieved August 8, 2015. ^ a b c d "2015 Cheez-It 355 at The Glen". Sprint Cup Series. Season 67. Watkins Glen, New York. August 9, 2015. Event occurs at 2:23 p.m. NBC Sports. NBCSN. Retrieved August 18, 2015. ^ a b c d McFadin, Daniel (August 9, 2015). "Denny Hamlin's hood flies up, blocks his windshield (VIDEO)". nascartalk.nbcsports.com. NBC Sports. Retrieved August 9, 2015. ^ Bonkowski, Jerry (August 9, 2015). "Keselowski leads Sprint Cup race at Watkins Glen; Jeff Gordon running last". nascartalk.nbcsports.com. NBC Sports. Retrieved August 9, 2015. ^ James, Brant (August 9, 2015). "Tony Stewart's return to Watkins Glen starts strong, ends in disappointment". USA Today. Watkins Glen, New York: Gannett Satellite Information Network, Inc. Retrieved August 9, 2015. ^ Kekis, John (August 9, 2015). "Joey Logano wins at Watkins Glen, saves fuel this time". AP Sports. Watkins Glen, New York: Associated Press. Associated Press. Archived from the original on August 11, 2015. Retrieved August 9, 2015. ^ Pistone, Pete (August 9, 2015). "Logano Sweeps Watkins Glen". MRN.com. Motor Racing Network. Retrieved August 9, 2015. ^ Pistone, Pete (August 9, 2015). "Kyle Busch Currently Chase Eligible". MRN.com. Motor Racing Network. Retrieved August 11, 2015. ^ Utter, Jim (August 9, 2015). "Kenseth surprises himself again". Motorsport.com. Motorsport.com, Inc. Retrieved August 11, 2015. ^ a b c d e f Motor Racing Network [@MRNRadio] (August 9, 2015). "#CheezIt355 Booth: @Jomo4, Jeff Striegle, @RustyWallace. Turns: @DGodfatherMoody @TheMikeBagley @BeckerTrackside" (Tweet) – via Twitter. ^ a b c Motor Racing Network [@MRNRadio] (August 9, 2015). "#CheezIt355 Pits: @WinstonKelley @TheAlexHayden @ThePostman68 @kimmiecoon. #AskMRN" (Tweet) – via Twitter.